Our clients have saved money and employee hours working with customized tape put-ups. When working with large quantities of material, it’s easy for much of it to go to waste if it doesn’t meet your exact specifications. 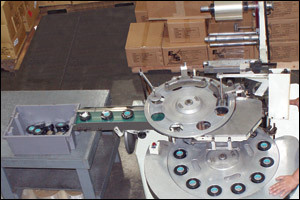 Would using a narrower width roll save a few dollars while meeting your requirements? 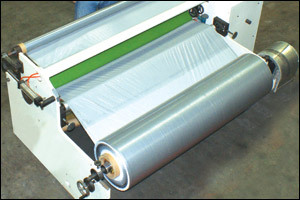 Allow us to provide a roll that is just the right size for efficiency and cost savings for your client’s process. Our rewinders provide the ability to rewind rubber tapes, butyl tapes, cloth, and paper tapes onto rolls of varying sizes customized for you. Our rewinding is done with meticulousness and care, all while following your specifications. We can rewind onto 1-1/2” and 3” ID cores in wide range of finished roll lengths. Each of our slitters specializes in cutting large log rolls into exact widths to fit your needs. We adapt each slitter to work with your specific materials and use converting techniques which ensures efficiency and precision. Flexible slitting equipment can cut various single and double sided tapes such as thin films, foils, foams, and thick rubber profiles. 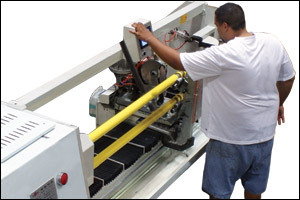 After slitting and rewinding your modified creation, our multiple packaging machines allow us the ability to cellophane wrap or heat shrink almost any size roll. We provide a perfect protective package for your finished products while maintaining cost-effectiveness. With this extra level of care, your order will remain safe from weathering and abrasion. Electro Tape offers our products to be custom labeled on the rolls and/or boxes to provide your company with a distinctly branded product. This is a great value-added feature that can encourage more direct re-orders from your clients and set your business apart from the competition. We provide private labels on boxes even if you are only ordering one case! Call us for more details.